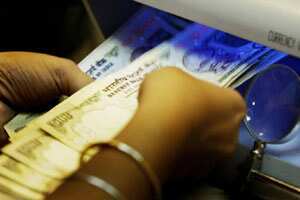 Mumbai: The rupee weakened further in afternoon trade on Tuesday dragged by dollar demand from local oil refiners and bunched-up outflows as US financial markets resume after an extended Christmas holiday. At 2:25 pm, the rupee was at 52.93/94 to the dollar, weaker than Monday’s close of 52.7250/7350. The unit has so far moved in a band of 52.75 to 52.98 and some traders believe the unit could breach the 53-mark later in the session. A trader said news that Japan and India were inching closer to a dollar swap agreement did not make a splash as traders await the deal announcement and inflows. Oil is India’s biggest import item and consequently, local oil refiners are the largest buyers of dollars in the domestic foreign exchange market.